How: Courtesy of Embrace, I’ve got two pairs of passes to give away for the show. Email me at contests AT chromewaves.net with “I want to see Au Revoir Simone” in the subject line and your full name in the body before midnight, July 13. Keith KlenowskiTo suggest I’m a little bit biased when it comes to The National is something of an understatement. The Cincinnati by way of Brooklyn band has put out two of my favourite records of the century in Alligator and Boxer, and when word came that their next record would arrive in 2010, I reserved a spot for it in my year-end list. That’s about as big a declaration of faith in the greatness of a record as a blogger can make. The flipside of this, however, is the probably unrealistic expectations that accompany that faith. Boxer was almost exactly the record I needed at that point in my life, and the odds of that sort of synchronicity happening again with its successor is probably about nil. This understanding did allow me some perspective in contemplating High Violet, but didn’t change the fact that it had some enormous footsteps to follow in. After all, Boxer was widely considered to be a watershed album. How do you follow up a career peak? By turning it into a plateau. If there were a way to actually quantify such things, High Violet would rate as almost as good or even better than Boxer, with the plus-minus determined only by one’s personal resonance with the material and the tone of the record. Whereas Boxer felt like a lightening of philosophy after the noir-ish Alligator, its elegiac mood has darkened again on High Violet. The glimmers of hopefulness that punctuated Boxer seem to have been muted and the angst and anxiety is again creeping in around the edges. This doesn’t, however, herald a return to the cathartic rock moves of Alligator; much to the dismay of fist-pumpers everywhere, it’s clear the band is well past its days of writing tracks like “Abel” and “Mr. November”. Instead, it manifests itself in a lyrical clarity that’s a ways removed from Matt Berninger’s typical obliqueness and his delivery, which finds him not necessarily expanding his range – I don’t think anyone expects him to find another octave anytime soon – but songs like “Anyone’s Ghost” and “Conversation 16” find him pushing it in unfamiliar directions or dwelling in parts of his voice that he might have only passed through fleetingly in the past en route to more comfortable territory. Though longtime collaborator Peter Katis is still credited as providing additional production and mixing, High Violet notably lists the primary recording site as guitarist Aaron Dessner’s garage and the band as sole producers; it’s evident that the studio was heavily utilized as an instrument on this outing, which represents an aural shift from the cleaner textures of Boxer towards something denser and sometimes hazier. Album opener “Terrible Love” sounds almost filthy with its base of fuzzy, tremoloed guitars and I’m still not sure what the oscillating tones that bookend “Little Faith” are. More familiarly, the orchestral accents and choral vocals that embellished Boxer have returned, but feel more like integral parts of their sound. Ultimately, High Violet triumphs by not trying to eclipse Boxer, but stand alongside it. The band offers growth without abandoning its strengths – hell, “Bloodbuzz Ohio” and “England” are two of the most National songs they’ve ever recorded. It’s thoughtful, sad and stately and, for all the shadows it casts, is downright luminous. The National are incapable of disappointing. There are features on the band at The Wall Street Journal, Spinner, The Fly, Canadian Press and The AV Club. Their live-to-web show at the Brooklyn Academy of Music in support of the Red Hot Organization is still available to stream at YouTube and you’ll probably get a lot higher quality stream watching it after the fact than in real time. The National play Massey Hall on June 8 and 9. The Antlers, who are opening both of those National dates and others on the tour, are interviewed by Beatroute and The Guardian. Pitchfork interviews Craig Finn and Tad Kubler of The Hold Steady; they’re at the Kool Haus on July 18. It was announced last week that bassist Carlos Dengler, upon completion of their new record, has left Interpol. Expect to see a new face – and perhaps moustache – holding down the low end when they open for U2 at the Rogers Centre on July 3. No release date for album number four has been confirmed. PopMatters talks to The Magnetic Fields’ Stephin Merritt. Strange Powers, the documentary about he and his band, will be getting a limited theatrical release on October 27. Acoustic Guitar interviews M Ward, who will be in town on June 9 at the Sound Academy as the “him” in She & Him. Reuters and The State profile Band Of Horses, whose Infinite Arms is out tomorrow. They play the Toronto Islands on June 19. Nada Surf busts out the covers for NPR’s World Cafe. Also paying a visit to the World Cafe is Josh Ritter, who plays a few songs from his new record So The World Runs Away. The Pains Of Being Pure At Heart have released a video for the title track of last year’s Higher Than The Stars EP. Pitchfork reports that some industrious fans have compiled an album’s worth of Titus Andronicus rarities and made them available for download as Feats Of Strength. Odds of them busting out any of this material when they play The Horseshoe on July 14 are poor. A couple of big shows have just gotten attached to NXNE – Eagles Of Death Metal at The Phoenix on June 16 and Girl Talk at the Sound Academy on June 18. Expect their names to show up in advertising all over the place and for a modest number of wristbands to get into each show (50 for Girl Talk). And speaking of NXNE, the schedule for this year’s festival is now online and yes, just like every other year, it’s impossible to use/navigate/save/do anything with. It’s called a grid, people – look into it. Au Revoir Simone have scheduled a date at the Great Hall for July 15. Their last release was 2009’s Still Night Still Light but they were recently featured in session at Daytrotter. The Jon Spencer Blues Explosion is back and will be exploding blues all over the Horseshoe Lee’s Palace on July 31. There’s no new material coming out of this short reunion, but there is a best-of comp in Dirty Shirt Rock ‘N’ Roll: The First Ten Years and reissues of the studio albums proper are imminent. Magnet has a Q&A with Spencer, who will be playing guest editor on their site this week. I’m really not sure what you could expect from a Van Dyke Parks live show, but Toronto will find out on September 29 when the arranger to the likes of The Beach Boys and Joanna Newsom, along with Clare & The Reasons, plays the Music Gallery. 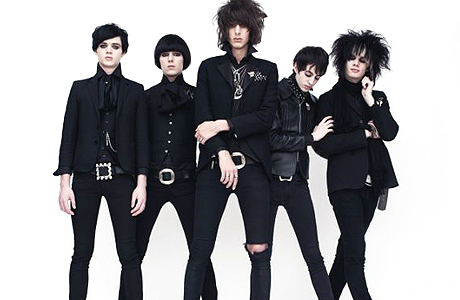 Tom BeardI didn’t pay much attention to London’s The Horrors when the released their debut album Strange House in 2007 because, well, they had a bad name, worse stage names and looked ridiculous and I’m shallow like that. No apologies. A few years on and the name is still bad but the pseudonyms are gone and they look somewhat less ridiculous and have a new album out in Primary Colours in a couple weeks. And you know what? It’s interesting. Produced by Geoff Barrow, the Kraut-gaze sound that dominates things isn’t the most natural amalgam of sounds, but the resultant gritty, metallic dronescape works pretty well. It can get somewhat texturally monochromatic over 45 minutes, but they sensibly inject poppy pit stops like the title track at key points through the proceedings. Faris Badwan’s vocals are from the Peter Murphy/Richard Butler school of emoting but with a pleasantly raw quality that I wasn’t expecting – I thought he’d sound more theatrical or overwrought. The record hasn’t worked its way into heavy rotation by any means, but it also doesn’t make me not want to listen to it. That may sound like faint praise, but considering the amount of stuff that I hear that DOES make me not want to listen to it, it’s actually something of a compliment. I’ll be spending more time with it in advance of their show at the Phoenix on May 7 when they open up for The Kills. You can spend some time with it now as Spinner is streaming the thing in its entirety. There’s also a rather grandiose video for the first single, which you can also download at their website in exchange for your email. Gigwise and NME both assembled track-by-track reviews of the record and NME also has a portion of a feature interview with the band. The third band on that Kills/Horrors bill, Magic Wands, have made a track from their debut EP Magic Love And Dreams available to download. It’s out May 25. Drowned In Sound has declared this week “Shoegaze Week”, and obviously I’m not going to argue. They kick things off by interviewing he whose song gave this site its name, Mark Gardener, formerly of Ride, and cover all the bases including THAT one, and the answer remains the same – “There is no plan to reform Ride at present and we’re all busy and very much involved in projects that we’re all doing now”. Artrocker talks to Maximo Park about the making of their new album Quicken The Heart, which is due out May 12. Jarvis Cocker has a new website, and I find the video there far more engrossing than any right-minded person really should. Look out for the “V”, Jarv! He also gives The Guardian the soundtrack of his life. His new record Further Complications is out May 19 and the first released MP3 sounds like this. Wireless Bollinger interviews Andrew Innes of Primal Scream. Black Book interviews Polly Jean Harvey. The Daily Mail interviews Polly Scattergood, whose self-titled debut is out in North America on May 19. There’s various remixes of her new single “Please Don’t Touch” by The Golden Filter up for grabs at Pitchfork, Stereogum and Gorilla Vs Bear. There’s a two–part interview with Super Furry Animals. The 48-minute doc to accompany their new album Dark Days/Light Years is currently streaming at Pitchfork. The Citizen-Times converses with Barry Burns of Mogwai. They’re at the Phoenix on May 4. New Pixies record this Summer? Maybe. Update: Not. Au Revoir Simone have a new record forthcoming in Still Night, Still Light, out May 19, and have scheduled a tour to support, including a May 21 date at Lee’s Palace. Portland acoustic pop duo Blind Pilot will be in town at the El Mocambo on June 12, tickets $10.50. That Passion Pit/Harlem Shakes show on June 16 is now confirmed – it’s happening at Lee’s Palace. Passion Pit have released a new video from Manners, out May 19, to celebrate their third attempt to play Toronto this year. Apparently The Enemy are quite the deal back in Britain – their debut was #1 in the UK and has gone platinum there, their follow up Music For The People is out next week – but I don’t think I’d ever heard of them until the press release announcing their show at the Mod Club in Toronto on June 19 showed up in my inbox. Is this something I should be ashamed or or thankful for? I’m kinda leaning towards the latter. Tickets for the show are $18.50. Dave Lowery and Cracker are back, with a new album in Sunrise In The Land Of Milk And Honey and a tour that now includes a June 23 date at Lee’s Palace in Toronto, tickets $20.50. Dallas’ The Paper Chase are releasing a double album this year in two parts – the first half, Someday This Could All Be Yours (Volume One) – is set for release May 12 and they’ll play the Drake Underground on June 29, tickets $11. Gibson Guitars deconstructs the ingredients of Wilco’s live guitar sound without any particular brand bias. Which is good for them, because I won’t be having anyone talking smack about Nels or his Jazzmaster. NPR is streaming the whole of St Vincent’s new album Actor in advance of its official release on May 5. Annie Clark talks to Womens Wear Daily about her music and wardrobe. 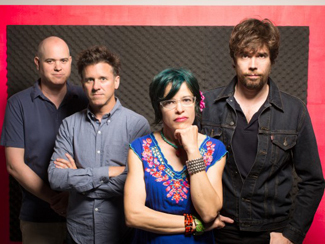 Magnet welcomes Superchunk/Portastatic/Merge-man Mac McCaughan into their guest editor’s seat this week with a Q&A about the return of the ‘Chunk and Merge’s 20th anniversary festivities. The Guardian considers the current wave of female pop artists garnering success in the UK, including Ladyhawke, Little Boots and La Roux.